Roughly 300 grams of fentanyl were confiscated earlier this year in Haverhill. The incomparable Prince--singer, song-writer, cultural icon--was killed by an accidental overdose of fentanyl. That’s the official finding of his autopsy, and it binds him to the thousands of others whose lives are being lost to this drug which is cheaper than Oxy and deadlier than heroin. While it isn’t a new drug, fentanyl has recently crossed from the pharmacy to the street. Smuggled into the US from Mexico, illicit fentanyl can be sold on its own, disguised as prescription pills, or cut into heroin. And it’s so potent than even teeny amounts can kill. As a recent Globe investigation showed, heroin and prescription opioids form an expecially toxic mix in Massachusetts, working in tandem to cause a spike in overdoses in 2014. Further analysis suggests that the key to understanding this pattern is fentanyl. 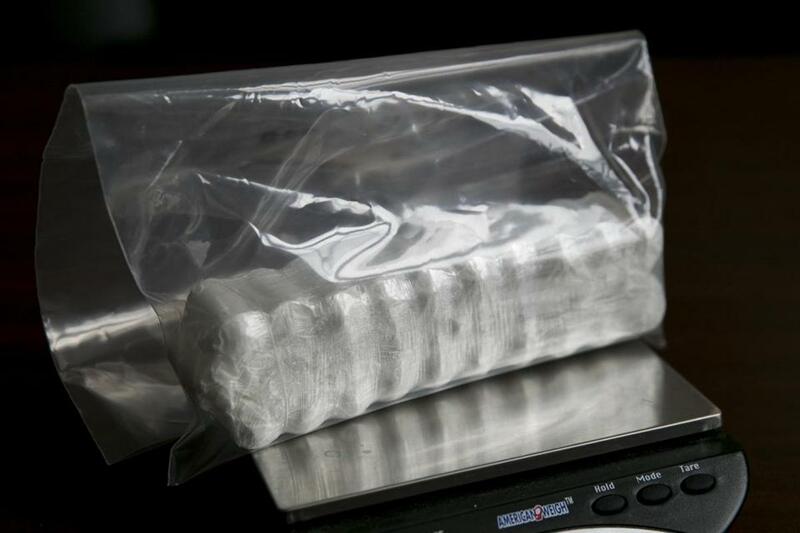 More than Oxycontin, Vicodin, or other familiar opioid painkillers, it’s fentanyl that’s joining with heroin to make Massachusetts’ opioid crisis particularly virulent. Fentanyl now contributes to roughly half of all opioid-related deaths in Massachusetts, which is part of what makes Massachusetts’ opioid epidemic so different from the rest of the country. Fentanyl is a powerful and fast-acting painkiller, used by doctors to help patients recovering from surgery or struggling with severe pain. But in 2013, a street version of the drug started taking lives in Massachusetts. And within a year, fentanyl became a leading killer, joining with heroin to drive up statewide overdose deaths. This explosion in fentanyl deaths provides yet another reason to shake off the idea that Massachusetts’ opioid crisis is driven by familiar “semi-synthetic opioids” like oxycodone, morphine, and hydrocodone. The Globe’s earlier investigation found that prescription opioid overdoses had slowed dramatically, and once you separate out fentanyl the pattern is even clearer. In Massachusetts, the death rate from those other, semi-synthetic prescription opioids has barely budged over the last decade. Instead, the vast majority of overdose deaths in Massachusetts are now caused either by heroin, synthetic opioids like fentanyl, or some combination. That’s strikingly different from the rest of the country, where only about 20 percent of opioid-relative deaths involve fentanyl and other synthetic opioids — for now, at least. Most of the data about state-by-state opioid deaths stops in 2014. But all signs suggest that fentanyl continued its deadly rampage through 2015. A briefing document prepared by the National Drug Early Warning System reported a possible surge of 2015 fentanyl deaths in such diverse locales as Maine, San Francisco, and Philadelphia — along with signs of increased fentanyl trafficking around the country. Here in Massachusetts, the latest numbers from the Department of Public Health are equally concerning. Statewide, over 50 percent of all overdose victims who got toxicology screens in 2015 had fentanyl in their systems. On the positive side, when you look beyond fentanyl there are signs of an overall slowdown in Massachusetts. Between 2014 and 2015, the number of opioid overdose deaths in the state increased roughly 10 percent — counting deaths from heroin, methadone, synthetic opioids like fentanyl, and semi-synthetics like OxyContin. That’s a welcome dropoff from the 30-50 percent increases of recent years. Still, without a complete breakdown it’s hard to know what’s driving this slowdown. Has heroin lost something of its deadly appeal? Has the state’s emphasis on prescription monitoring furthered reduced the already-low level of deaths from prescription drugs? Or could it be that overdoses are actually increasing as fast as ever, but that deaths are slowing because of the widening availability of the overdose-reversal drug Narcan. For now, it’s hard to answer these questions with any certainty. What does seem clear, though, is that the contours of Massachusetts’ opioid crisis have changed, yet again. Fentanyl is the rising menace. And while it’s not clear whether Prince got his fentanyl from a doctor, or the black market, we now know his life was cut short by this same plague. * The category of “synthetic opioids” includes other drugs, like Tramadol, but fentanyl seems to be driving the surge in deaths.